The meme, taken from Parks and Recreation, likens communism to mental illness. A controversial meme has sparked tensions between two on-campus groups, the SRC Disabilities Collective and the Sydney University Students for Liberty Society (USyd Libertarian Society). 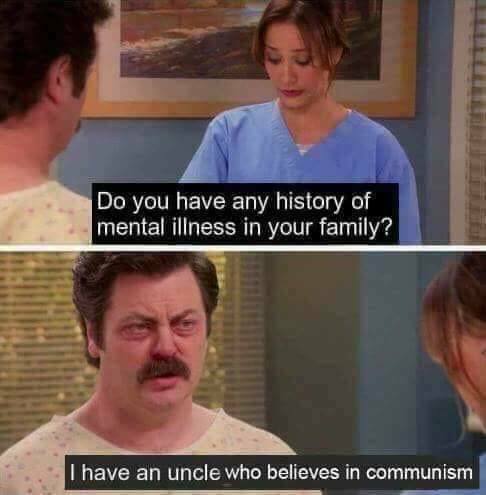 The offending meme involves a screenshot from comedy show, Parks and Recreation, which depicts a nurse asking “Do you have a history of mental health in your family?” The corresponding image sees the patient respond with an altered caption: “I have an uncle who believes in communism”. The meme triggered a debate about political correctness, mental illness and ableism in the comment section. People who disagreed the meme was problematic proceeded to respond with ableist slurs. Members of the Disabilities Collective were labelled a “retard” and ridiculed for “[sic] sperging out” after a student complained to the Office Bearers of the Collective, prompting their involvement. Mollie Galvin, also an Office Bearer for the Disabilities Collective, was sent multiple death threats. Additionally, Eames, who is in a wheelchair, was told by two separate people to “roll” and “wheel off ledges” when they tried to explain the problem with the post. Members of the Disabilities Collective initially commented to share why they believed the meme was harmful. Eames told Honi, they were “polite and brief and referenced the USU’s constitution and the University cultural competency guidelines”. In response, an admin for the Usyd Libertarian Society said the “ridicule is targeted towards those that believe in Communism, not at those with mental health problems” and asked members of the Disabilities Collective to “get professional help”. According to Eames, the post was distributed to external, non-USyd pages and groups by various figures, including the admin who initially made the post—spreading the post’s reach beyond normal metrics. Responding to a complaint lodged today, the USU issued a statement from 2018 President, Courtney Thompson. Thompson wrote that the USU does “not condone any form of harassment” and has asked the USyd Libertarian Society to remove the meme. The post is allegedly in breach of the C&S guidelines and policies, as well as clause 4 of the University’s Student Code of Conduct which states all students must be treated with “respect, dignity, impartiality, courtesy and sensitivity” and must not “become involved in or encourage discrimination against or harassment” of others. Thomson acknowledged it is “very rare for the USU to step in this way” and “while [they] encourage robust debate in our communities, it is our opinion that this conversation went beyond what we deem to be acceptable”. An admin for the page claimed in a comment that the post “uses no USU resources” but “[i]f the USU asks us to delete [the post]” they would. According to Thompson, the club has now refused to delete the post, and the USU has since escalated the matter. “With regard to our decision not to remove the post, we would simply like to hear the specifics of our alleged breach, after which we would reluctantly oblige,” Sorras said. According to Sorras, the Society did not refuse to take it down, but rather, it was a case of miscommunication. “Unfortunately, I missed a call from the Union this morning,” he said. “I would still welcome the opportunity to speak to the President”. Thompson did not confirm the USU’s next steps. “We’re looking at all options at the moment”, she told Honi.